A Maine photographer is joining forces with dark-sky advocates to say that people must be careful about where they direct their lights. 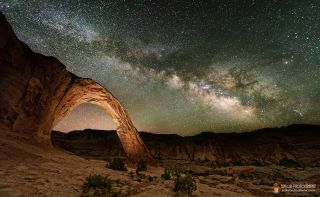 Mike Taylor, a landscape astrophotographer, says he often has to travel long distances to capture the stunning shots he is getting known for in shares on Twitter and other social networks. "I've had many people on social media respond to shots of the Milky Way by asking me where they could go to see it or if it was real," Taylor said in a statement. "Real? Yes. Where can they see it? Sometimes it's necessary to travel up to 50 to 100 miles [80 to 160 kilometers] to escape the haze of light pollution that blocks our view of the Milky Way." While light is an annoyance to stargazers, it can also hurt the ecosystem, the International Dark-Sky Association says. Light can disrupt movements and migrations of sea turtles and birds, cause adverse health effects in humans (the effects were not specified in a press release), and waste energy and money. Several areas in North America and Europe have adopted dark-sky preserves to protect astronomical imagery and the local wildlife. The celebration of Dark-Sky Week started in 2003 out of the efforts of a high school student, Jennifer Barlow. This year's celebration takes place during the International Year of Light 2015, an initiative from the United Nations Educational, Scientific and Cultural Organization. UNESCO says the initiative "will highlight to the citizens of the world the importance of light and optical technologies in their lives."